The Owl Creek Gazette is participating in the DIY Street Faire in downtown Greenville, IL on Saturday, June 16th from 9am-3pm. All you Do-it-Yourselfers will want to check out our 70's Solar Camper along with the many clever money saving/energy saving creations from Don's Uniques! for an up Close Look at our Twist on the Past". 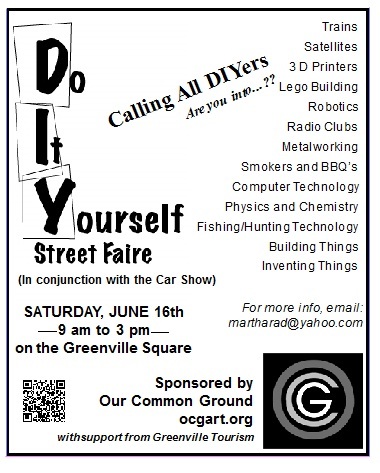 We'll be talking about the DIY Street Faire tonight on the Saturday Night Ride Radio Show. Tune in to 89.5 FM (in Greenville, IL) or streaming live on WGRN.net at 7:30pm to hear the details.